MAY PRIZE: WHO’S THIRSTY FOR A WATERMELON DRINK? - What About Watermelon? You are here: Home / Nutrition / MAY PRIZE: WHO’S THIRSTY FOR A WATERMELON DRINK? You know, it’s good to see watermelon-flavored drinks finally making an appearance in grocery stores. Nothing against, oranges, apples and grapes — their juice is great, too — but watermelon juice is long overdue for its time in the beverage spotlight. It’s catching on with some big names, too. According to Details magazine, A-listers like Leonardo DiCaprio and Beyoncé are big fans of watermelon-infused drinks. I’ve been known to make my own watermelon beverages from time to time, but if I can buy a pre-made drink — one made with REAL watermelon juice — I definitely will. 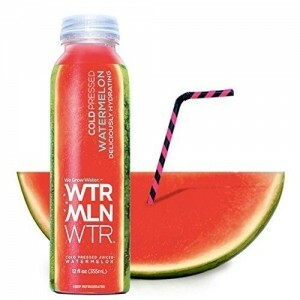 One of the newest juices is called WTRMLN WTR, which mixes cold-pressed watermelon flesh, rind, and lemon juice to create a drink that’s made for summer, but tastes good all year round. Like any watermelon juice (or watermelon snack), it’s loaded with natural nutrients like citrulline — an amino acid that’s great for muscle recovery — and lycopene. Both of those perks make watermelon (juice or snack) a good post-workout habit. Of course, my workouts these days involve mowing the lawn and chasing a four-year-old around the living room, so I eat watermelon every chance I get. I’ve purchased an 8-pack of WTRMLN WTR for myself and will give another 8-pack away as this month’s prize to one commenter chosen at random ALL the comments left on the blog this month. Cheers! UP NEXT: What’s the best kind of watermelon?